Property Details: 3 Bedroom, 3 Bathroom Vacation Rental, sleeps up to 8. 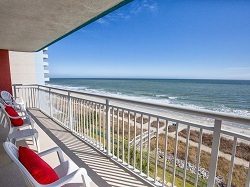 Grand Atlantic condo, beach resort home in Myrtle Beach South Carolina. Everything is Great at Grand Atlantic-Sit on Your Ocean Front Balcony and Watch the Kids at the Pools! ....Enjoy The Views of The Atlantic Ocean From The Living Room, Dining Area, and Kitchen plus The Master BR Balcony! What could be Better Than Looking Out At the Ocean While Cooking and Entertaining Friends and Family... New 55 inch LCD HDTV with Blue Ray DVD Player~Free Wireless Internet, Cable TV, DVD Players in Living Room and all BRs Plus A Library of Movies to Choose From ... Amenities such As a 170 Foot Indoor Lazy River, A 65 Foot Large Outdoor pool, Indoor Kiddie Pool With Mushroom and Bubblers, & Outdoor Play Pool with Mushroom and Waterfall, All with Gorgeous Views of The Beach and Ocean, Indoor Heated Water Amenities for Year Round Enjoyment, ~Perfectly Located, Parking Conveniently Located on Same Floor....Convenience Store and Scooby's Restaurant for lunch by the pool or Room Service.~Custom Decorated With 18 Inch Imported Tile, New Granite Countertops in Kitchen and all Bathrooms...Master Bedroom with Master Bath Opens to Oceanfront Balcony..New Furniture in Master Bedroom....Washing Machine and Dryer~Convenience Store and Scooby's Restaurant for lunch by the pool or Room Service. Grand Atlantic Condo Rental in Myrtle Beach SC..